No more lots left to accommodate this Hickory model any longer in Cresswind and this home offers a premier waterfront lot. If you want to be on vacation every day and are looking for a country club environment, then you will enjoy the beautiful Cresswind Community in Market Common. 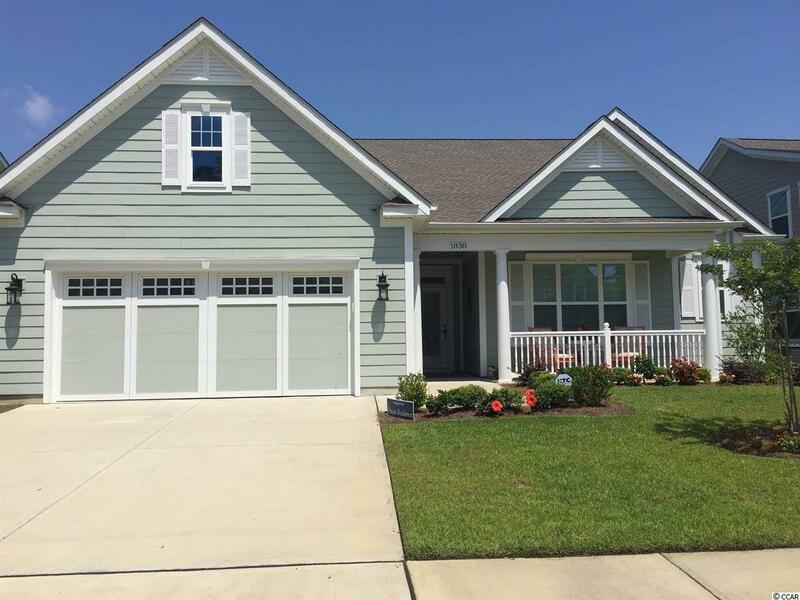 Located just minutes to the Myrtle Beach International Airport, shopping in Market Common and gorgeous sandy beaches, this Community has it all. The stunning 12,000 SF Amenity Center features a fitness center, pickle/bocce ball and tennis courts, water aerobic classes, resort style pool and just about anything you can imagine. There is even an amphitheater for outside entertainment. This waterfront home is simply PERFECT. This Hickory model features all the upgrades you can possibly desire with gorgeous hardwood floors, 24'x12' screened porch, extended 4 ft garage, gas fireplace and so much more. Once you enter this home you are captured by the expansive water views and fountain that can be seen from the Great Room, Dining Room, Carolina Room and Screened porch. The gourmet kitchen offers upgraded light cabinetry, GE Cafe stainless appliances, butler pantry and a Blanco diamond sink. The first floor Master Bedroom is spacious with upgraded carpet and ample space for a sitting area. Master Bath is fabulous offering quartz counter top with double vanities, walk-in tiled Roman extended shower with hand held/rain shower heads. The 4th bedroom or bonus room on the 2nd floor is ideal for guests offering much privacy and includes a full bathroom. Home is complete with custom window treatments and plantation shutters. Sellers have painted the home throughout with a soft color palette. A security and whole house surge protection system along with upgraded ceiling fans and exterior front and back lights have all been installed. Location is excellent with the popular Market Common district down the street offering shops, movies, and restaurants. There are numerous walking/bike trails and outdoor venues to enjoy, such as Art Festivals and summer concerts at Valor Park. There is absolutely nothing to do but move in, unpack, jump on your golf cart and head to the beach. Why Build? Home is LIKE NEW and in pristine condition. Directions: Cresswind Is Located In Market Common And Main Entrance Is Located On Farrow Parkway. Take First Left On Suncrest Drive From Main Entrance And Home Is Located On Right Side With Beautiful Water Views.